Happy first day of summer! I don't know about y'all, but here in Texas, it's felt like summer for a few months now!!! Now, when I say that I have tried every product on the market...I mean it. High end, drug store and everything in between! I wanted to narrow down some of my tried and true products. Now I know what works for me may not work for the next person, but if you have been struggling like I have, definitely give these products a try! :) And please let me know what products work for you! I'm always up for trying new things! So once I wake up and finish my morning skin care routine, I always finish off with this BB Cream / tinted sunscreen. I LOVE this entire line so much! What I love about this product is that it also has anti-aging benefits and dries to a matte (almost powdery) finish. On days I'm just lounging around the house, this is all I wear. It does not provide much coverage but the finish is beautiful and it leaves your skin immediately looking smooth and even! and lets face it, sunscreen is a MUST! On days I'm wearing a full face of makeup, I use 3, yes THREE, primers! Let me explain! haha! No matter how much make up I am wearing that day, I ALWAYS use the Smashbox Primer Water. Though it's not "mattifying", the way it leaves your skin feeling is worth it in itself. I've gone through 3 bottles of it! It's packed with revitalizing electrolytes and leaves your skin looking refreshed and healthy. For me, it helps prevent that "cake face" look and helps your foundation melt into your skin. It's free of silicone, alcohol and oil so you don't have to worry about it making your skin look more oily, which some products can do. It simply makes my skin look more awake and healthy, which we all want! After the primer water, I will apply the Benefit Matte Rescue Primer. I usually only use this product if I am going somewhere special or planning on taking pictures and need the "extra" help. I really like the way it helps minimize my pores. It also has a fancy "diamond powder", known for its soft-focus pore-blurring effect. When I apply this, I put a small amount on my finger tips and dab it (almost like pushing) it into my skin where I have large pores. Mainly on the apples of my cheeks and my nose. I also apply a little on my forehead, because I get really oily there too! Another product that I really like to use to help is the Laura Mercier Translucent Setting Powder. I usually just dust this all over after my foundation but if you really want to make your makeup bullet proof, flawless AND shine free, bake your face with this powder! Seriously, it's a miracle worker. If you don't know what "baking" is, as crazy as it sounds, it does work! It's basically putting a s%*t ton of powder where you need it (my t zone) and letting it sit (or bake) for 10-15 minutes. Then you dust it off and girl let me tell you......your makeup won't go anywhere and that oil won't be peeking through for HOURS! I also use the "baking" method for my concealer under my eyes and it WILL NOT CREASE ALL.DAY.LONG! But I like to use BÉSAME setting powder in Lavender for under my eyes. Sephora has it in Lavender but it's not letting me link that color for some reason. I will never, ever be without this product. I have tried the De-Slick Oil Control Setting Spray from Urban Decay as well but I prefer the "all nighter" more. It actually lowers the temperature of your makeup to keep your makeup in place in all weather conditions. And we all know that hot and humid conditions are not ideal for oily skin. 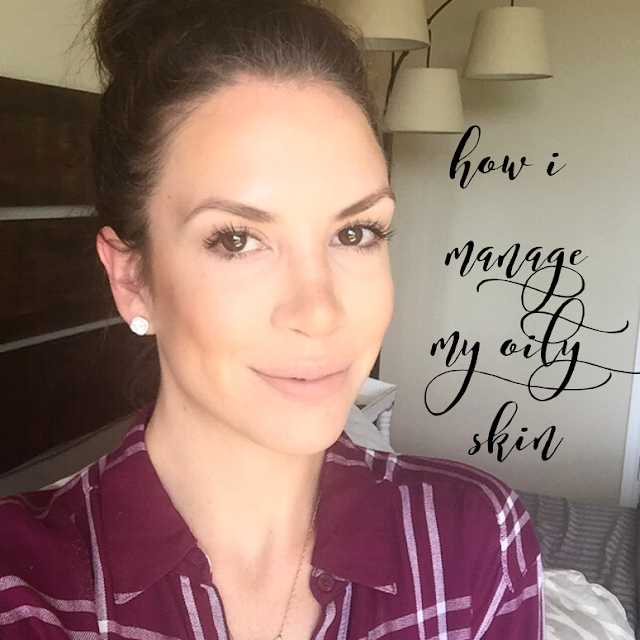 It really does help your makeup stay on much much longer and if you are battling oily skin, you know the frustration of your makeup looking like it disappeared only after a couple hours. This product is a MUST! I can definitely tell a difference when I don't use it! I hope this helped some of your stuggling like I have for years! Again, if you have any secrets up your sleeve, PLEASE do share! I LOVE LOVE LOVE trying new products! Thanks again for stopping by!